Our stock traders can check the Free Nifty Tips Here. Pl click the link here to get latest update on Nifty. Crude can make or break the nations as courtesy crude King of Saudi Arabia is a richest man on the Forbes list and crude was the reason which led to fall of Saddam Hussain or shall we call his greed was responsible for his fall from top to a manhole. 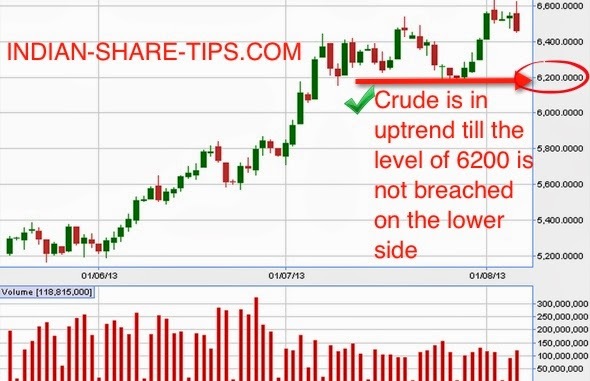 As we have stated that crude will remain in uptrend till the level of 6200 is not breached and thus as a strategy one can short crude moment it breaks 6200 level with volume. You can check free commodity tips here.